Demystifying UV Filters: What is light transmission percentage? The 82mm 98-UVATS UV Filter is one of Chiaro’s highest-rated protective UV filters with 98% light transmission. It’s ideal for photographers of all levels who demand high-quality glass and other essential features for excellent image fidelity and construction. Box Dimensions (LxWxH) 4.5 x 4.5 x 0.8"
82mm 98-UVATS UV Filter is rated 4.7 out of 5 by 16. Rated 5 out of 5 by ron from Good quality i bought this filter as a replacement for a cheaper brand filter for my Sigma 150 - 600 C lens. The other filter felt as though it would cross thread too easily and the filter actually fell off when i picked up the lens. This filter is quality constructed and adds no noticeable color cast. i tried the lens with the filter off and on and see no difference. of course i was looking at the photos in Lightroom with no measurements but i'm not that concerned about it. I asked one of the sales people here in chat about the filter and he recommended it highly. The price can't be beat. Rated 5 out of 5 by Floyd from I Love Chairo Filters. I'm a semi pro photographer for more than 40 years and ALWAYS keep Quailty filters on all of my lenses. ?Over the years I've used many different brands depending on my needs but I typically have used either B&W or Cokin.? I recently discovered the Chiaro Brand of filters from a photo magazine and after reading the article I thought I'd give them a try. ? Well they are excellent filters and a very good price. This is the 3rd Chiaro filter I've purchased and they have become my filters of choice. ?Their use of Schott glass makes them Optically perfect.? I like the fact that they rate all of their filters on the perecentage of light transmission and they do this in a big way. Most other manufacturers either don't mention it or it's a hidden specification.? The use of Brass construction makes for a much more durable filter and the slim frame eliminates any vignetting on wide angle lenses.? Finally I love the option to have both Top and Side Knurling for mounting and removing them. 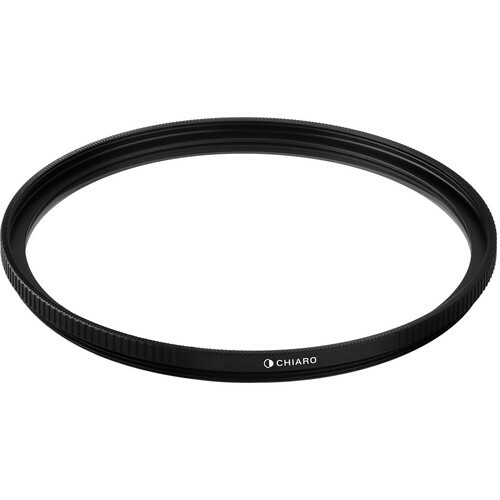 The Side Knurling gives me a much better grip for removal If you are looking for a Top Quality Filter at a very good price try any of these Chiaro Filters you won't be dissappointed. Rated 4 out of 5 by Anonymous from great cheap filter nice filter cheap and sturdy BUT it doesnt work with the voigtlander 35mm lens hood. The opening on the hood is to small to fit around the filter. Rated 5 out of 5 by Anonymous from Solid and well-constructed This UV filter has the look and feel of much higher priced competitors. It is solidly constructed and I love the knurling - or grip - on the top and sides. If you are willing to spend twice as much, you can get the UVBTS that gives you 99% light transmission with a brass ring, versus 98% transmission with the aluminum ring - but the cost-benefit ratio on this filter is high. Five stars for value and solid construction. Rated 5 out of 5 by Gary from IT'S A CLEAR LENS FILTER I use this filter on my Sony 28-135mm lens using a Sony PXW-FS5. I had been using a filter with some tint to it and this clear filter, in my opinion, is much better for truer colors, IF and ONLY IF that is what you are looking for. With all of the color grading these days it is all a matter of preference. I mainly bought this filter for protection for my very expensive lens. Rated 5 out of 5 by Brooke from Happy! I am very happy with this filter. I almost purchased a canon for double the price... but I found this one and I am very happy with it! Rated 5 out of 5 by Lorraine from Protect camera lens Bought this Chiaro UV Filter to protect my camera lens. It arrived in a timely manner and fits...Good to go! Rated 5 out of 5 by Anonymous from I would recommend this product! This is an excellent filter for an excellent price! Fits nicely, protects nicely, cleans nicely! Will this fit on my vintage canonet G iii QL?